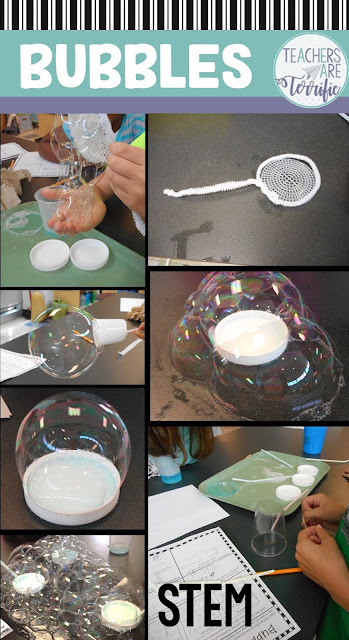 Have you ever tried bubbles in your classroom? I mean, inside your classroom? Sounds pretty daunting, I know, but I am about to let you in on some little secrets! You do not need fancy materials. Keep it simple, but make it an experiment. This can be a design challenge, too. Alright! Keep reading and you will be ready to tackle some bubbles in the room! Bubbles, bubbles everywhere (not really)! Just like everything we tackle in our classrooms, things always go better when we plan-plan-plan. We have procedures for lining up, getting our lunches, and the hallway. Your science or STEM lab has procedures, too, I am betting! So, what about Bubble procedures? Our main rules are simple- try to keep all of the bubble blowing and dripping on the table and clean up spills immediately. I am lucky to have very large lab tables so the first rule is easy. The tables get messy, but we try to keep the drips off the floor. The rule about cleaning up is for stickiness and also safety. You don't want anyone slipping in spilled bubble solution! The bubble solution is easy to mix and makes a large quantity. We also use lids from jars or small bowls. The bowls I use are from the Dollar Tree- they are a 2-inch diameter and shallow. We have also used small metal pans. For blowing bubbles we use straws! For the design challenge, I do add a few more materials. More about those later! The first time I tried this challenge in the STEM Lab I knew I wanted to add some science to the event. So, we researched the science of bubbles and learned so much. Do you know what makes the rainbow colors in the bubbles as they are blown up? This design resource has the students experimenting with blowing bubbles in different ways and recording the results. It's a great discovery lesson with a lot of oohs and ahhhs! Of course, kids want to just blow bubbles, so be sure you add enough time to let the explore freely. The only rule I have during this exploration is that they cannot just blow straight into the solution in the cups to make the bubbles. I tell them this: "We already know what will happen if you do that! What else can you learn by trying something different?" Here's how we make tabletop bubbles. Dip one end of the straw into the bubble solution and then place your finger over the other end. The straw will hold the bubble solution. Now release that onto the table. Gently blow into that solution as it spreads across the table and bubbles will appear. I know this sounds messy, but the straw only holds a tiny amount. And the results are pretty spectacular. This Can Be a Design Challenge, too! So, how did we make this into a STEM Challenge? We made bubble wands! Students were shown an array of materials and they could choose 2-3 things to put together a wand. Then they tried the wand to see if it would work. What were the materials? It is different every time I try this challenge, to be honest. I just start grabbing things from my supply cabinets that might make a wand. We always use pipe cleaners and straws. I usually add binder rings, hair ties, and those little plastic grids you see in the photos above. Kids love those and they make endless bubbles pour out. Look at the photo below. Don't use tape if you can avoid it. These wands get soggy and soapy and tape won't stick. Make sure your bubble wand will fit in the bubble solution container. Sometimes ours are too big and we can't load them with bubbles. Clean up is easy but will take some time. The good news is that your tabletops will be so clean when you are finished! Wipe the tapes with a dry paper towel. Then spray the table with a cleaning spray- I have 409 type spray or a Windex type spray. Use a wet wash cloth to wipe down the tables with the cleaning spray on them. Repeat with fresh wash cloths are no more spray and then dry with dry towels. So, what do you think? Are you ready to try bubbles in the classroom? Do You Need a Robot to Make Your Life Easier?